In the new DB-Engines ranking of September 2016 PostgreSQL reaches its all-time popularity high. 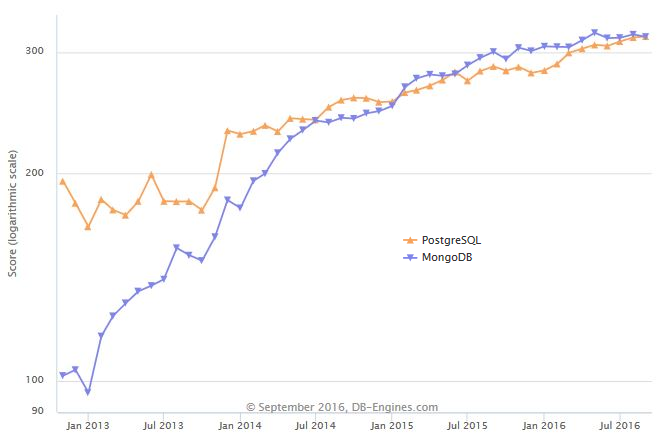 Since at the same time MongoDB lost a few points, PostgreSQL could overtake MongoDB and climbed to rank 4. PostgreSQL is the second most popular open source RDBMS, only behind MySQL. It is backed and continuously improved by a strong community, with the focus currently being on performance improvements like parallel query execution and scalability on many-CPU servers. MongoDB is the uncontested leader of the NoSQL group of systems and shows an exceptional increase of popularity over the past years. However, our measurements give some indications for a beginning saturation of that trend. It will be interesting to monitor both systems in a changing database world with new challenges like cloud-readiness (MongoDB recently started its MongoDB Atlas cloud service), support of 'Internet of Things'-requirements and many others.